We recently reviewd four of the top toaster convestion ovens to determine which was truly the best: the Breville Smart Oven Plus #BOV810BSS ($250 on Breville.com), the Cuisinart Chef’s Convection Toaster Oven #TOB-260N ($235.45 on Amazon), the Hamilton Beach Set & Forget Toaster Oven #31230 ($89.99 on Amazon) and the Kenmore Elite Digital Countertop Convection Oven #0876771 ($149.99 on Kenmore.com and through Sears). Our top pick was the Cuisinart Chef’s Convection Toaster Oven for its excellent cooking results, food capacity and convenience features. However, the Breville was close on its heels. And for those with a little less countertop space, it may be the better choice. The Smart Oven is available on Amazon and multiple other outlets for $249.99. The Smart Oven Plus is a William Sonoma exclusive for $249.95. And the Smart Oven Pro is $269.95 through Amazon and other sources. Our review was done with the Smart Oven Plus. However, the results would apply equally to any of the three models. We didn't test the slow cooking feature as it seemed unlikely that most owners would make use of it and, frankly, we felt a little uncomfortable leaving a hot toaster unattended for 6-10 hours at a time. But based on the overall performance of the Breville, there's no reason to suspect that the slow cooking feature wouldn't perform as expected. Each model we tested could fit our 3-lb chickens and 12-inch pizzas without issue. The Cuisinart Chef’s Convection Toaster Oven offered the most interior capacity of .95 cubic feet, while the Breville Smart Oven was about 20% smaller (.8 cubic feet). In practice, this didn't make much difference with any of our tests. However the Cuisinart is large enough that it can actually cook with two interior racks, a nice bonus. The trade-off for that extra capacity is less counter space. The Breville dimensions are 18.5 inches wide vs 20 inches for the Cuisinart, and 15.75 inches deep vs 17 inches. The Breville is a little shorter, too, at 11 inches ve 12 inches. Any device that includes “toaster” in its name should be able to toast; not something that many toasters live up to, sadly. We were looking for six slices of toast that were evenly cooked no matter where on the rack they were in and had the same level of toastiness on the bottom. So we popped the slices in, set each toaster to “Medium” and let them go. The Breville also offers a “bagel mode”, which lets you brown just the top part of your bagel or English muffin. Here's how the Breville performed versus the other models. Interestingly, we found that toasting evenness has a lot more to do with your bread than your toaster. As you can see in the comparison shot, the top of the slice was consistently more toasted than the bottom, regardless of toaster or orientation. We presume this is due to lower moisture levels at the top of the loaf. 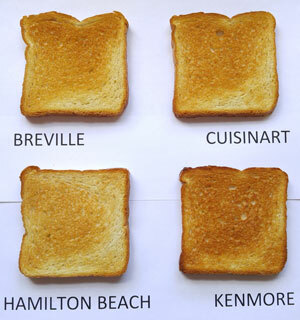 We found that the Kenmore provided the most toasting, just ahead of the Cuisinart and Breville. We tested each of the ovens on a frozen 12-inch pizza using their pre-defined “pizza modes”, when available, or else followed the directions on the pizza box. Two of the ovens, the Cuisinart and the Kenmore, come with pizza stones included in the box. However, both stones arrived broken, so it's hard to count this as a "feature". Buying your own stone with the Breville, if desired, may be less trying on your sanity. The results were clear that those ovens that cooked slowest, the Kenmore and the Hamilton Beach, also cooked the most evenly. The Cuisinart, which cranked out the pizza a few minutes faster than the others, was the least even. The Breville was close behind the leaders. That being said, we're actually calling this one a tie, because the pizza modes on any of the ovens can be customized to cook at whatever temperature you want (you don't need to stick with the factory preset). It’s a simple matter to dial down the Breville to cook slightly slower. And our six person taste test (including three hungry kids), found that all the pizzas tasted pretty much the same, regardless of how even they appeared on top. All four of the ovens did a surprisingly good job with the birds - better, actually, than our non-convection standard kitchen range. But the Cuisinart Chef’s Convection Toaster Oven was the runaway winner here. Its “Speed Convection” mode delivered the fastest cooking time, evenly cooked meat and, most importantly, beautifully browned skin. The Breville, again, was in second place behind the Cuisinart. While Kenmore was the slowest of the lot, taking 10 minutes longer than the Cuisinart to fully cook the bird. And the small Hamilton Beach produced chicken that was paler on the sides than the others. Its temperature probe was useful, but still required double checking with our Thermopen to make sure that there weren't underdone areas. The slower cooking Kenmore delivered the most even browned cookies, followed closely by the Breville, but the Cuisinart and Hamilton Beach weren't far behind. 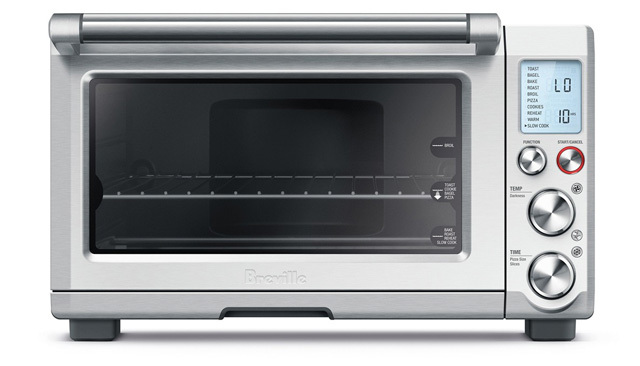 The Breville Smart Oven Plus uses a combination of knobs and buttons to set the various cooking modes and temperatures. If it all sounds confusing, it is. But after a few times through you get the hang of it. And, once you have your cooking presets set the way you want them (e.g., you can dial down the temperature for Pizza mode or turn off convection for Cookies), the process is pretty easy. The Breville's control knob had a higher quality feel to it than the Cuisinart, which felt surprisingly cheap, given its higher price. The Breville has a clock on its display to remind you that you're late for work. Our tested model, the Smart Oven Plus, does not come with an interior light. However, the slightly more expensive Smart Oven Pro does. I don't think a light is really necessary for a toaster oven, so up to you if you want to pay $20 more to get it. The Cuisinart tops the charts with a very strong 4.8 out of 5 star rating on Amazon and no major complaints. The Breville Smart Oven line does pretty well, too, with 4.5 out of 5 stars on Amazon, though there were some issues with units dying shortly after warranty and poor customer service. The reviews for the Smart Oven Plus on William Sonoma were similar, with strong reviews overall, but a not insignificant number of people complaining about falling units. That's a little bit of a concern because the Breville comes with only a 1-year warranty versus 3 years for the Cuisinart. The Breville Smart Oven Plus (and the other models in the line) is an excellent oven that performed well across the board. It offers enough food capacity to make it a viable substitute for your full-sized home oven. It missed being our top pick to the Cuisinart due to its smaller interior capacity (.8 cubic feet vs the Cuisinart’s .95), lower user ratings and shorter warranty. For those looking for a slightly smaller model (or who value a slow cooker function), the Breville would be an excellent alternative to the Cuisinart. When choosing which Breville model to get, the Smart Oven Plus offers the best value—it's the same price as the Smart Oven but includes the Slow Cooking feature (though only available through WIlliam Sonoma). If you want a light for not much more, go with the Smart Oven Pro.